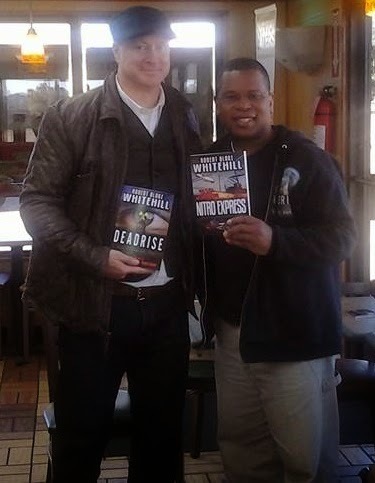 It was a great pleasure to travel to Mississippi and finally meet Cyrus Webb, a media personality I have long admired, and a man who has been so supportive and encouraging of The Ben Blackshaw Series from Deadrise, through Nitro Express, to the current release, Tap Rack Bang. Webb is editor in chief of Conversations Magazine, as well an artist, and an author. His inspirational book, Words I Choose To Live By, is touching hearts and minds around the world. My day with Webb included three signings in the Brandon area. It was like jumping headfirst into a very civilized tornado; fast and yet fun. All the readers who attended the events, some of whom were authors in their own right, had great questions about Blackshaw and writing the series, as well as inquiries about the Chesapeake Bay region and Smith Island, Blackshaw’s home. It was a treat to be an ambassador for my small but very special part of this country, especially with Mississippi residents who can claim so much fascinating history of their own. I returned home from Mississippi with an enriched friendship with Cyrus Webb, all the more grateful for his encouragement, and his strong commitment to the written word. I look forward with pleasure to heading back to the Magnolia State soon!